Chinese New Year also known as the spring festival is the most famous Chinese festival celebrated at the turn of the traditional lunisolar Chinese calendar. It is impossible not to be caught up in the energy of this festival as one can see themselves squeezed into the crowded temples to pray for good fortune, festive markets, auspicious food and shock red lanterns that adorn the city. 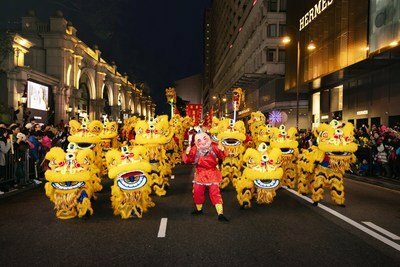 Hong Kong Tourism Board (HKTB) will be hosting a special Chinese New Year Night Parade featuring a splendid line-up of 9 floats, and 25 Mainland, international and local performing groups. With fabulous parade of floats, international and local performers, stunning fireworks show over the harbour, heart pounding actions at the race track, this ancient festival has a unique Hong Kong flavour. The Chinese Zodiac moves in a 12 year cycle. According to Asian Astrology, a person’s year of birth and the animal it represents determine a lot about their personality traits. This year, 2019 is the year of Pig. Anyone born in the year of Pigs is diligent, compassionate, and generous. The International Chinese New Year Night Parade is one of Hong Kong’s most anticipated annual events, with fantastic floats and spectacular performances by local and international performers welcoming Chinese New Year with a festive energy that is uniquely Hong Kong. Themed ‘Best Fortune. World Party’, the parade will take place on Chinese New Year day, bringing positive energy to everyone in the audience and a vibrant party to see in the Year of the Pig. Nine magnificent floats and over 20 local and international performing groups will depart from the Hong Kong Cultural Center and proceed along the main streets of Tsim Sha Tsui. With lots of energy and passion, international performing groups will celebrate their unique cultures and extraordinary skills with hip hop dancing, cheerleading, acrobatics and more. Locals believe that a stroll in the bustling Chinese New Year flower markets bring good fortunes as fruits and flowers symbolise good fortune. In preparation for Chinese New Year, locals stock up on festive treats and delicacies which offers guests in an ornate red snack box called ‘chuen hap’. One will often find some of ‘the eight sweets’ in local households: candied shredded coconut, lotus seeds, bamboo shoots, kumquat, lotus root, coconut ribbons, and winter melon. In addition to symbolising a sweet time in the year ahead, different treats bear different blessings: lotus root sounds like ‘plenty of surplus’ in Cantonese, deep-fried peanut pastries promises advancement, and the golden deep-fried sesame balls bring to mind a home full of wealth. The Hong Kong Tourism Board (HKTB) is a government- subvented body tasked to market and promote Hong Kong as a travel destination worldwide and to enhance visitors’ experience once they arrive.